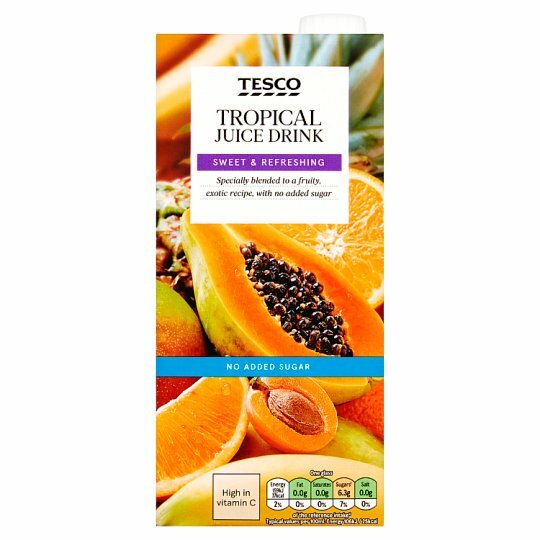 No added sugar tropical fruit juice drink with sweeteners and vitamin C.
SWEET & REFRESHING Specially blended to a fruity, exotic recipe, with no added sugar Our drinks experts have been creating juices and juice drinks in Somerset for more than 30 years. We carefully evolve our recipes over time, using absolutely no artificial flavours or colours. INGREDIENTS: Fruit Juices from Concentrate (47%) (Orange, Pineapple, Mandarin, Lemon, Kiwi, Lulo), Water, Fruit Purées (5%) (Apricot, Papaya, Mango, Banana, Guava), Citric Acid, Flavourings, Colour (Mixed Carotenes), Vitamin C, Sweeteners (Sucralose, Acesulfame K). Store in a cool, dry place., Once opened, keep refrigerated and consume within 5 days. Shake well before opening and pouring.Best served chilled.